It’s no secret that Thailand’s capital is not just a place to start and end your island-hopping trip but also a great place to stay long term, for studying, for working (online), for being retired, for whatever reason it has more and more foreigners living in Bangkok. The first and most important step when moving to Bangkok is obviously to find an apartment. The good news is that the search for an apartment in Thailand’s capital is not nearly as difficult and time consuming as in most western cities. I live in my third apartment in four years here, so I think that I can give you some general guidance and tips on the topic of finding an apartment in Bangkok. Because I was in exactly the same position when I first got here, and figured out everything by myself. Since Bangkok is such a big city, you should first decide on which neighborhood you would like to live in. The most modern and “hip” (but also most expensive) areas are Sukhumvit (this includes Asoke, Nana & Phrom Phong), Thong Lor, Ekkamai, Siam and Silom, which are all located next to each other in the city centre. The further you go away from these areas, the cheaper the rental prices. If it doesn’t bother you to sit in the metro for 7-10 stations to the city centre (and maybe even change the line), then you will find some really good deals especially in Sutthisan, Ramkhamhaeng and Udom Suk. Like 5,000 Baht a month for a simple studio (25-30 sqm) in Udon Suk in comparison to 20,000 Baht in Nana. I have lived in Huai Kwang for 2 years (4 stations by MRT from Sukhumvit in downtown) and now for more than 2 years in Ratchada (2 stations by MRT from Sukhumvit). For a similar apartment you’d pay at least double that price in Sukhumvit. Sure, sometimes it would be more convenient to live right in the centre, but you can also get quite quickly to most places in the city by metro. And besides that, you’ll have smaller and bigger shopping malls, restaurants, bars and parks pretty much everywhere in Bangkok. The main difference to the city center is that you’ll find most of the foreigner-oriented places in the centre, for example the red light areas and the best western restaurants. Similar for the districts Phra Khanong, On Nut, Sathorn (Lumphini) and Ratchathewi, which are all located along the metro line and offer a great mix of reasonable priced apartments and proximity to the city centre (like 4-6 stations by BTS to Asoke). An extremely important criteria when choosing the location of your apartment is the distance to the metro stations: BTS Skytrain, MRT Subway and Airport Link. Make sure that your apartment is not too far away from a metro station – it just makes life here so much easier, more enjoyable and flexible. Because I assume you would like to get around the city quite a lot, right? Ideally, the closest metro station is no more than 5-10 minutes walking distance, even though in that case the rental prices will be somewhat more expensive (always in relation to the specific neighborhood). If the apartment building is located further away, then there’s always a motorbike taxi service from and to your apartment. For example, at my first apartment in Huai Kwang the service hours were from 6am to 10pm (that’s also typical in other areas). There I had the choice of either walking for 15 minutes to the Huai Kwang MRT Station, or to take a motorbike taxi for 15 Baht. That’s also the typical price all over Bangkok – about 1 Baht per 1 minute walking. And don’t be afraid, there are almost never any scams with the motorbike taxis, like that they overcharge you as a Farang – and certainly not if you do the standard trip from your apartment to the metro station. As soon as you decided on which neighborhood you would like to live in (or you have 2-3 favorite ones), then it’s now time to compare as many apartment / condominium buildings as possible – regarding the price, comfort, amenities and location. If you are currently outside of Thailand, then you can certainly do your research online and even book an apartment. I will explain why I don’t think the latter is not a good idea, but let’s go into that part for a moment first. Of course you can take a look at apartments online. However Bangkok is a very big city, so you probably don’t know which area you will like, and also it’s often hard to tell how far a specific apartment is really away from the public transport – especially the BTS Skytrain and MRT Underground. Google Maps is not always of great help here, because the apartment buildings are often located in narrow Sois, where you can’t walk very fast because you always need to look out for the many motorbikes and cars. You can’t see that on the map. The other problem with researching on the internet is that you can’t know about potential noise from construction, cleanliness, air quality, view from the apartment, restaurants (sure, there are street vendors and small restaurants everywhere, but that doesn’t necessarily mean that you like their taste), parks, cafes, bars and so on. But again: I would use these sites only for doing research. The pictures on these websites often look much better than in reality and like I said, you should really get a feel for the neighborhood before making a decision. For your first days in Bangkok I recommend you to simply stay in a hotel, and then take a look at different apartments in your preferred area during the daytime. Different to most western cities, where there’s a shortage of available apartments, in Bangkok most buildings have unoccupied units to rent out (which is probably due to the boom in real estate, which doesn’t show any signs of slowing down any time soon). In my experience (and I have looked at around 50-60 different apartments here) about 95% of them have available apartments. They will then not only tell you the different room types and rental prices, but also let you take a look at one or more apartments. That’s extremely important (ask for it if they don’t say anything). Quality of the mattress (in many “typical” Thai apartments the mattress is stone hard and you’ll have to buy a softener for about 2,000-6,000 Baht). Are there CCTV Cameras in the corridor? If not, is it possible to put a big lock on the door? Is there a swimming pool / fitness room? If you pay a monthly rent of about 12,000 Baht or more, you should expect that. When I came to Bangkok about 4 years ago and knew that I would be working in Fortune Town right at the Phra Ram 9 Station, of course I wanted a room somewhere close to the MRT line, and after talking to some local Thais I learned that the Huai Kwang area has great deals – close to the city centre (4 stations to Sukhumvit and 2 stations to Phra Ram 9) as well as very reasonable room rates. Ratchada has great value apartments too (that’s where I live now), is 2 stations closer to Sukhumvit and just a little bit more expensive. How much are apartments in Bangkok? For my first apartment in Soi Intamara 55 in Huai Kwang (picture below) I paid 4,700 Baht base rent per month (including WIFI), and with all the utility costs (the aircon always consumes by far the most) it was about 6,000-6,500 Baht per month. That was about half the price I paid for my student room in Berlin – for double the size and with private bathroom and balcony. Yes, that’s right: Most apartments up until about 10,000 Baht per month are equipped only with a bed, a mattress, a wardrobe, a mirror, a small table and a small chair. 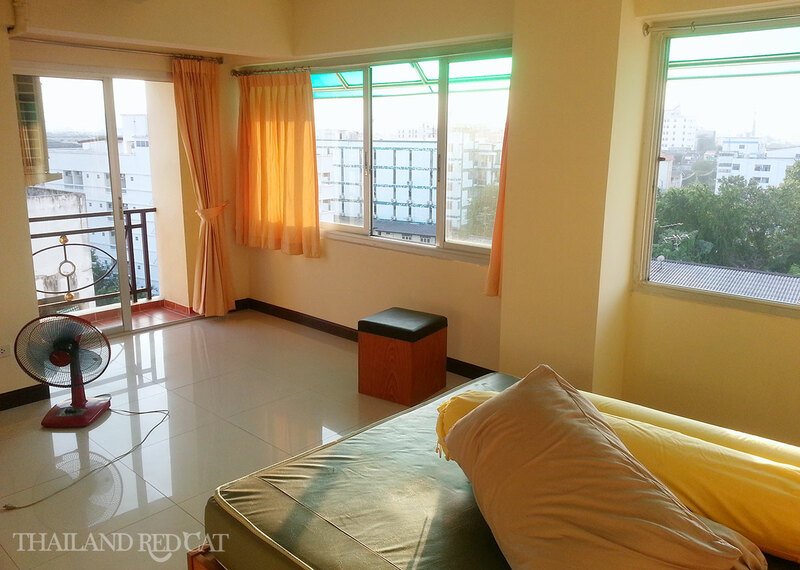 My second apartment in Bangkok was two metro stations closer to Sukhumvit – in Ratchada Soi 3. There we paid for a slightly larger, but older studio (= main room, bathroom and balcony) of about 35 sqm 5,500 Baht base rent and 6,500-7,000 Baht utilities included. And my third apartment (where we live now) is also in Ratchada Soi 3, a 1 bedroom apartment with much more comfort and space (60 sqm). It’s a new building and even has a swimming pool and fitness room on the 2nd floor. We pay 17,000 Baht per month base rent and around 19,000 Baht utilities included. After you personally took a look at a few apartments and think you have found the right place for your budget and preferences, it’s time to confirm the final details: How long is the minimum rental period? Usually 6 months, in the expensive apartments in the city centre often even 1 year. You may also be able to agree on shorter rental periods, like 1 month or 3 months, but then the rent will be slightly more expensive than if you sign for half a year or one year. As you can see, it’s not necessary to show a business visa or work permit to rent an apartment in Bangkok. A tourist visa is sufficient. Often they don’t even want to see the visa, they just take a photocopy of the first page of your passport. You also don’t need to have a Thai bank account. You pay the rent in cash. It works like this: You get the monthly invoice between the 27th and 30th/31st every month and need to pay until the 5th of the following month. Otherwise there’s a late fee of 500 Baht. Even the downpayment can be paid in cash in case you want to make a reservation. You get a keycard for the house door, a room key (or keys if you have a 1 bedroom apartment), login details for the WIFI (in case they have one) as well as the rental contract (usually in Thai, but you can ask them to issue one in English) of about 5 pages. You also have to sign a list with all items that are in the room at the start of the rental (and maybe remarks on their condition). Check that well when you move in, so that there are no misunderstandings when you move out. The notice period for rental apartments in Bangkok is usually 1 month. That means if you want to move out on the 1st of June, you will have to tell your landlord at latest on the 30th of April. The requirement is of course that you have fulfilled the minimum rental period, otherwise he may not give you back your deposit. So, on the 1st of June you will give him back the room keys and he (or the caretaker) goes into your room and checks if everything is alright as well as if all items on the list (see above) are still in the room. You shouldn’t worry too much about the deposit. I have already moved out of two apartments here in Bangkok, and I never had any problems. Just the last time they kept 200 Baht, because the wall was damaged from hangers I put there (those can be bought in supermarkets and usually be removed without friction – well, usually). Finally your landlord calculates how much you get back from the deposit. Since you’ve already paid the room rental in advance, there’s only the utility costs for the past month. So assuming the deposit was 20,000 Baht and the utilities are 3,000 Baht, then you get back 17,000 Baht and say goodbye with a friendly Sawatdee krap! As always, great information in your article!! Wow, Your video is awesome. Great bit of info. I’am a American looking to live in thailand with my friend who is thai, it would be better if you found a roomate to share the cost of living. But it seems that you can do it, But I get rid of the car,provided that you live near good transit. anyway best of luck friend. Thanks Mark, glad the info is useful for you. Good luck for your apartment search!